The fire was reported just after 1 a.m. at the Saint Patrick Church at 88 High St.
Fire officials struck three-alarms, summoning area firefighters from onset, Carver, Mariion and other towns. The cause of the fire is under investigation. No damage estimate was provided. 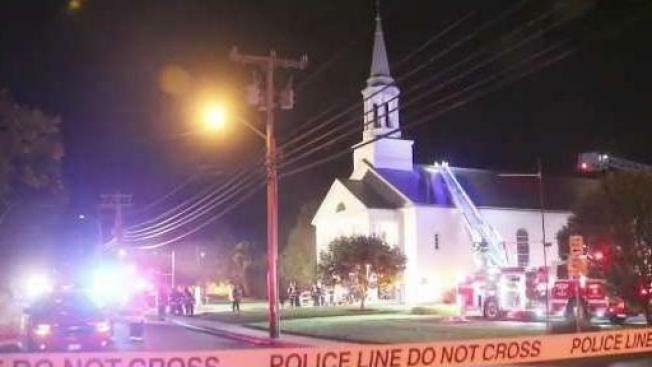 Wareham fire officials extinguished a three-alarm fire at the Saint Patrick Church early Saturday morning. The fire was reported just after 1 a.m.
"Upon arrival, the duty captain reported smoke coming from the roof and fire showing inside the structure from the front," fire officials said in a prepared statement. Fire officials in charge at the scene struck three alarms to summon additional firefighters to the church, located at 88 High St., and to cover the fire station. Mutual aid was provided by Wareham Police, Wareham EMS, Onset Fire, Carver Fire, Marion Fire, Rochester Fire, Bourne Fire, DFS Special Operations and the Providence Canteen. Firefighters extinguished the glaze and vented the building. The assisting towns were sent back but a Wareham fire crew stood by overnight to ensure the fire did not break out again.